In my never ending search for viable Independent Candidates to run for a seat in the House of Representatives in 2014 I believe I’ve found another winner. When I ran across Craigs twitter account I noticed he said he was running for Congress in 2014 so I immediately contacted him. When I discovered he had served in the Marine Corp in Iraq and was a patriotic American hoping to do something for his country and was running as an Independent because he, like myself, felt the two party system had let down the country and no longer represented the interests of the average American I was thrilled. I arranged both a written interview, shown below, and a blog radio interview which will be on Monday, July 1st at 7 p.m. PST. Please listen at www.blogtalkradio/angelsandwarriors. If you can’t make it on July 1st the radio interview will be available for rebroadcast at your convenience. Just go to the above webpage address and scroll down to previous episodes and look for the Books and Politics show on July 1st. Well, I was born and raised in Ogden, Utah.Â Spent most of my life nestled close to the mountains, growing up to enjoy the outdoors; camping & hiking were a huge part of my childhood.Â I am the oldest of five children, and my parents are still together going on 30 years! I served in the Marine Corps for almost eight years, getting my honorable discharge in 2010.Â I was in the infantry and served a couple of combat deployments to Iraq and some military advisement missions. Currently I run my own business selling patriot supply and teaching firearms classes. 2. Why are running for Congress in 2014? I felt like there was no other option left for me to be honest. I have tried the phone calls, petitions, letter writing, etc. and nothing ever seems to change. I decided to throw my hat into the ring after a couple years of wondering if I should or not. After seeing the political climate of the United States, I decided now was the time. I was also very tired of seeing finger pointing and lots of talk about what’s wrong, but no solutions. I love my country very much and watching it being destroyed is killing me. I also have to do it for my kids. My dad always taught me about the greatness of America, a land of opportunity. I want the same opportunities for my kids. 3. I understand you plan to run as an Independent. What party does the incumbent belong to and what is the registration split between Democrats, Republicans, and Independents in this district? I am running as an independent in order to stay true to my values. Rob Bishop is the current sitting incumbent of Utah’s 1st District and is a Republican. 2012’s breakdown of the election was 70% Republican, about 24% Democrat, and the remaining voters were various third party. 4. Running against an incumbent Republican in a heavily Republican district will be difficult. Do you believe you have any chance of winning? I think I do. I have something that is a little bit different in the way I am towards politics. 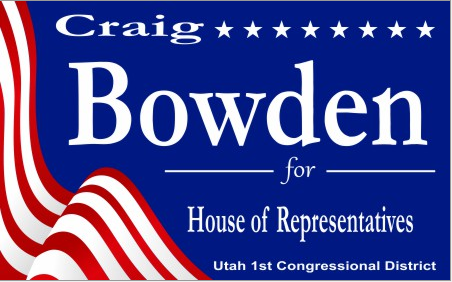 First of all, I am not partisan, it is about putting America and the voters of Utah first. I also don’t have to worry about adhering to a party’s platform. While Utah has primarily been a Republican state, the party has been slipping a lot on what kind of values really matter to Utahns. I also have a strategy in mind to take things to a whole new level. I don’t want to go too much into detail on the political strategy, but essentially the focus is on reaching out to the people, not big donors or businesses. 5. What do you believe are the top three issues in your District and what are your positions on those issues? (a) Federal government getting out of education. (b) Worries about the financial mess our country is in. My stances are really simple with these. a. The federal government, several hundred miles away does not know what is best for the state of Utah. We keep pumping more and more money to the Department of Education and what has it done? Schools are still failing, test scores aren’t going up, and many districts across the country have students that can’t read, right, or do basic math. Instead of raising the bar, the government has lowered it so kids don’t feel bad about not graduating with their class. Essentially the high school diploma has become nearly worthless. b. Each state and municipality needs to have the ability to control the kind of education their children receive. The community knows the best industry standards for their specific areas. This will also breed a recipe for competition. Top performing areas are going to attract people. If a state wants to be competitive in the job market, they step up their schools. c.The other thing we need to do is allow bad teachers to be fired. I have heard literally hundreds of horror stories of teachers that don’t care, won’t do their jobs, and in some cases even molest children, but they still get paid. They still get to keep their jobs. This is not the kind of education the American people need. Trying to remove a bad teacher in a heavy union state is nearly impossible. It can take up to two years to finally get rid of them. That needs to change. 6. I note you are a former Marine. Do you feel our porous borders, particularly in the south represent a risk for possible infiltration by terrorists? If so what can we do about it? No such thing technically as a former Marine. Once you earn the title, you are a Marine for life.Â But I understand what you mean. Not only do I think our borders represent a risk for infiltration, I know it is. There have been reports of groups already working with coyotes and cartels in order to get their people across the border. To name two notable ones: Hezbollah and Hamas. As for what we can do about it, there is a lot. First we need to build the fence. The president and Congress can produce 90 billion dollars to poor into green energy companies that go bankrupt, but we can’t find any money to finally finish the fence? It’s ludicrous. On top of the fence, I have a proposal in mind that would reduce the amount of military we have stationed overseas in non-conflict countries (saving millions of dollars) and moving them to assist in securing our borders. They are already being paid on active duty, so I would like to see them rotate units to the border and work with our border agents. We also need to suspend the restriction environmental groups have put along the border. While I believe we do need to protect areas, we cannot sacrifice the well-being of our people in doing so. A true environmentalist in my opinion is one who respects the area around him (pack it in, pack it out or cut a tree down, plant a new one). 7. My book, Stop the Insanity Target 2014, includes an idea that could reduce the cost of a four year college education by up to 40%. Is this something that voters in your District might be interested in? I know that this is an area that concerns many Americans, including the people of Utah. As a personal example, my fiance really wants to be a veterinary assistant. There are only a few schools that offer the course. Even if she got student loans, which would pay in the short term, the school was charging an outrageous sum that would have totaled nearly 50,000 dollars. Bear in mind this was a two year associate’s degree. Clearly something needs to be done in order to decrease the amount of tuition our future workers in America. The debate over student loan interest rates is not the way to go about it. It actually sets about a bad tone of debt equals success, which doesn’t always end well. The majority of the time, when a large loan is taken out, it sets you behind, not ahead, especially when you are talking about getting into a job that makes only around 14 an hour. What can be done? I am not 100% sure, but we do need to explore options to help out students get degrees to help them succeed without killing them.Â Largely though, this needs to be left up to the states, because this is an area that is not listed in the Constitution as a power granted the federal government.Â I would like to see states start taking the charge of creating lower cost schooling for degree and certificate programs, and would put my endorsement behind such plans in Utah.Â But again, I feel this is an area that the federal government must not meddle. Craig, I’m sure you will love my plan. It does involve the Federal Government but could be implemented by the State of Utah as well. Best of all it won’t cost taxpayers one red cent. We can discuss it on our scheduled radio show! 8. My book also proposes withdrawing a large percentage of our troops currently based overseas. Would this idea resonate in your district and what do you think of it? As I mentioned earlier with my border security initiative, I wholeheartedly believe that we need to start evaluating the bases overseas and shutting down what is not absolutely necessary, bringing our troops home. I believe this will save billions of dollars, and will provide an ample resource to protecting our borders. 9. Assuming you did manage to get elected, do you believe an Independent Congressman could have any effect in Washington? I believe that I could have an effect, especially since I am attempting to show a perspective not often seen in DC. I believe that when an Independent runs and makes it, they can be effective since there is not pressure to tow some line to stay popular with the party. You are more able to stand up for the people. I have been a firm believer that you should put the people first, not the party. There has been a long standing power struggle between the Democrat and Republican parties, and when that happens, the best isn’t always done for the people. Our first president, George Washington, actually warned of this danger in political parties fighting over power in his Farewell Address. He had amazing foresight, and we really should heed the warning he laid out for us. I would like to see less R vs. D and more of a government by the people, for the people. 10. My own belief is that to have any impact it would be necessary to elect 20 to 30 Independent members of Congress. If we did that would you be willing to work with the other new Independent members as a block to negotiate with the Democrats and Republicans to see that important changes are made to our government? I would be willing to work with anyone, regardless of affiliation or lack thereof, so long as they keep the people and the US Constitution at the forefront of the policies and laws they seek to enact. I would not be willing to work with someone wanting to continue the downward spiral the progressive movement has started. I do believe we need to shake the balance of power, so I would endorse any third party or Independent candidate willing to do the right thing. 11. Could you provide listeners with the address for your webpage? And any other information that would allow them to keep up with your campaign plans and perhaps contribute towards your effort? There are a couple of avenues you can connect with my campaign. I do have the ability to accept donations on the two websites listed. And my last word is this: we can keep doing what we have been doing for the last hundred or so years, electing the same people over and over, but get the same results. Or we can seek out candidates like myself who are going to obey the oaths we take and bring a restoration to America. The people must come first, and that is why I am doing what I do. Well Craig, you’ve just hit on the meaning of the title of my book. Einstein defined Insanity as doing the same thing over and over and expecting a different result. We have to end this insane behavior of American voters and 2014 is the time to do it. Hence the title: Stop the Insanity Target 2014. Craig, it has been a pleasure and I’m really looking forward to our live blog talk radio interview mentioned at the start. I hope the readers, especially those in Utah, noted that it is possible to contribute to your campaign through your website and will take advantage of that. Best of luck and I’ll be talking to you again on July 1st.